One still finds latter-day versions of that 1939 3-D iconic puzzle of unique geometry. They may be differently colored, slightly other-shapen, but almost always sacrileges. Somewhere, in my residual scree from childhood, lies one of the orange plastic originals. I might still be able to assemble it blindfolded. It's wrongly formed: the Trylon, the last piece to insert, pierces the Perisphere. In one overly sophisticated interpretation, it's a metaphor for that penetration that paradoxically holds everything together. 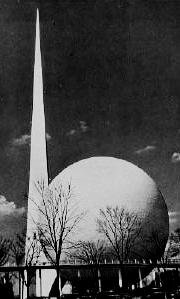 Though I was only eight years old, that New York Worlds Fair was one of the great delights of my childhood. The "World of Tomorrow" beckoned. The world that I would live in, glistening, mechanical and stupendous, with transportation and communication systems that people had only imagined: they were already here and demonstrated, in working order! The buildings themselves, showpieces for only a year or maybe two, were breath-taking marvels. It was the best ever of my summers of remedial culture with Aunt Marie. My dear aunt, you understand, never liked Pa, hated the farm, and couldn't understand why Ma married him (her "I love him" was not an acceptable reason). And why they lived in such remote God-forsaken country, so far from New York City. But she could redeem us children to some extent if only she could drag them, now and then, through New York's art museums, the opera, Central Park, the Bronx zoo, the aquarium, the Museum of Science and Industry (Wow! ), the Planetarium, the Statue of Liberty. And parade them through the Village to her highbrow leftwing friends. So the fair, blooming in New York that year, was a bonanza for her program. I recall things, public and personal, that a child remembers. Aunt Marie and Eva, my age, and I are standing in line for the General Motors exhibit. We're already half an hour in line, and that much still to wait, still ahead, and I have to pee. There are no rest rooms in sight; I don't say anything. But I just gotta go. Ever so discretely, I let it run down my leg and it makes a puddle on the walk. We're just about to step off the scene of the crime when Aunt Marie glances down shouts "Kenneth!" Too late to point upward and say Look, what's that? How awfully, terribly embarrassing. Why didn't I this and that, she days, and I what can I say? And why did Eva have to be there? Anyway, onward. In GM's Futurama you sat in a train of chairs moving sideways and looked in and down on a gorgeous diorama of roadways and bridges and tear-drop shaped cars, at the same time hearing (properly synchronized for you) about the wide and straight highways and everything else in the world of 1960, when I'll be already half-way old! It was a hundred times as big and exciting as any electric train layout I had ever seen. All eyes and ears I was, and I even started to imagine that, when I grew up, somehow I might help to build that world. There was a car that opened and closed its doors, hood an trunk, as a guy spoke commands into a microphone. How? "We don't want to tell you, because we want to be the only ones doing this!" And a robot that spoke words when somebody wrote on a typewriter — words that had not been recorded in advance because, believe it or not, somebody in the crowd came up with the phrase, right then and there! I saw supremely round ball bearings, so perfectly formed that they rolled out of a hole, bounced off one, two, three(!) flat plates, set at funny angles, small but so perfectly polished flat, that the balls finally fell into a small target receptacle! 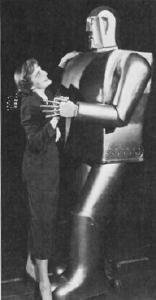 The marvels of fabrication and machinery (and of showmanship) were endless. And they were at least two steps beyond what an eight-year-old could have imagined, even a little guy who could well see how a hay bailer worked (but was, in fact, still puzzled by the inner workings of a threshing machine). 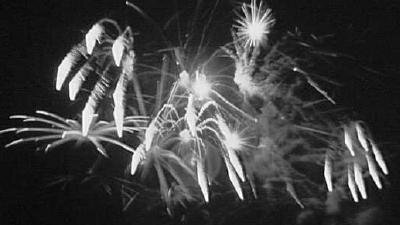 The bang-up of a climax, literally, at the end of the day, was a fireworks show over a lake at the center of the fairgrounds. From where we stood, the flashes and noise were a grand background for that Trylon and Perisphere. In truth, more urgent problems loomed, as David Gelernter describes well in his book "1939." As a youngster, I was unaware that Europe was beginning to fall into a terribly savage time. For me, the opening gong of war came two and a half years later, on that Sunday afternoon that we all sat around the living room, stunned into silence, listening to the radio. Scattershot reports drifted in, slowly confirming original suspicion that it was the Japanese who had bombed Pearl Harbor, and that tremendous damage and casualties had been suffered by our sailors and fleet. That war lasted from my sixth grade through the ninth, during which time I did the normal patriotic chores of picking milkweed pods for use in soldiers' sleeping bags, flattening tin cans for recycling, and buying stamps that accumulated into war bonds. Busy with school, and not a devoted real-time follower of battle fronts, I learned later the details of V-I and V-II attacks on London, battles of Midway and other islands, fire bombings of Tokyo, Hamburg and Dresden. But two events did stand out vividly at the time: the D-Day landing at Normandy on my 13th birthday, and the advent of a fantastically powerful new kind of bomb that we dropped on Japan in August of 1945. The war, that had seemed to me interminable, might soon be over, and maybe all wars, so devastating and terrifying was this new weapon.